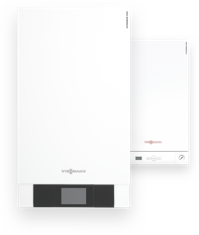 When it comes to choosing a new or replacement gas boiler, it is easy to become confused by the many different types of boiler available. For those less familiar with some of the terms in use, it is easy to find yourself asking if there is a difference between a combi boiler and a condensing boiler? Read on to discover everything you need to know about gas condensing boilers including how they work and what to look out for. It is important to understand the difference between these two words which can be easily confused. To help understand the difference, let’s take a closer look at what they mean. What’s the difference between a combi boiler and a condensing boiler? The term combi boiler is short for combination boiler and refers to a boiler that is able to provide both heating and hot water within a single unit. They are supplied by mains water, which is heated internally. Unlike an immersion heater, a combi boiler heats your water on demand, instead of storing it in a tank. This means there is no need to have a separate header tank or storage tank for hot water as was commonly found in older houses. As well as saving space, combi boilers are generally considered to be the most economical type of boiler in the domestic environment and the best choice for the majority of households. A condensing boiler is any boiler which uses condensing technology to make better use of the heat they generate from burning fuels such as gas or oil - so a combi boiler can also be a condensing boiler. Today, the vast majority of boilers in UK households are gas condensing combi boilers. Do I need a condensing boiler? UK building regulations introduced in 2005 make it compulsory for all new gas boiler to use condensing technology. With their increased efficiency, they are greener to operate and can save you money on your heating and hot water bills. In addition, they are also considered to be safer than the older non-condensing boilers. According to the Energy Saving Trust, you could benefit from savings of over £300 a year by choosing to replace an old G-rated non-condensing boiler with a new high-efficiency condensing boiler and improving your heating controls. Older, non-condensing boilers wasted between 30-50% of heat due to combustion gasses escaping into the flue. Thanks to modern technology, a condensing combi boiler, in contrast, can be up to 99% efficient. So how is this possible? In a condensing boiler, heat existing in the flue gasses can be captured and ‘recycled’ back into the heating system and used to preheat the cold water entering the boiler. During this process, the temperature of the flue gas is rapidly reduced from around 130℃ to 50℃. This fall in temperature causes condensation, from which the name is derived. This condensation can be as much as two litres an hour for a very efficient boiler and is drained into your waste water outlet by what is known as a condensate pipe. Because they are able to reuse energy that already exists, condensing combi boilers help to save money on your energy bills. They also have a much lower carbon footprint, helping you to combat climate change by reducing CO2 emissions. Why is a condensing boiler safer? Non-condensing boilers generally take in air from inside the room. A condensing boiler, on the other hand, captures air directly from the outside of the room it is placed in and is completely sealed for heat insulation. This means that there is no risk of anything being sucked into the boiler. Another safety advantage is that because the condensed liquid is disposed of via a pipe connected to the drainage system, there is no risk of being in contact with toxic substances. Advances in technology mean that modern boilers are incredibly reliable. However, because every type of boiler is different, they all have certain advantages and disadvantages. As mentioned in the previous section, a condensing boiler produces a constant flow of condensate which drains into your household’s waste water just like your sink and washing machine. For safety, if the outlet becomes blocked your condensing boiler will automatically stop. The most common cause for this is a frozen boiler condensate pipe. This is most likely to happen if your boiler has been fitted with a condensate pipe that is outside the building and therefore exposed to lower temperatures. Although a relatively common problem during cold snaps, it is easily prevented and fixed. What size condensing combi boiler do I need? There are two key factors to consider when deciding what size of condensing gas combi boiler to buy - how much hot water you are likely to use and how many rooms you will need to heat. For most standard 2-3 bedroom houses with a single bath and shower, a combi-boiler of between 24-30 kW is a good choice. For homes with an additional en-suite bathroom or more rooms, a larger 30-35 kW boiler would be recommended. Read our article on choosing the right boiler for your home for more advice and information.